Look at paintings of Australian landscapes and talk about the colours that are predominately used. What colours depict the dryness of our climate? Why are sunsets so brilliant in colour? Where do you think our native animals inhabit? When do they forage for food? Describe the shape of a gum tree? What is a silhouette? Stimulate discussion and research with questions such as these to give students a starting point to decorate their hat. Just imagine all spectators wearing an Aussie hat at the outdoor events to protect them from our sun. 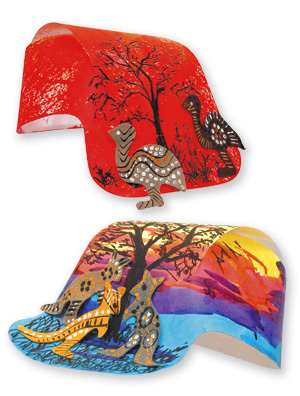 Students can design a typically Australian hat and have a hat parade as part of the Commonwealth Games celebrations. Use Food Dye or Ink to colour the flat cardboard template and set aside to dry. Use a black Oil Pastel to draw the silhouette of a gum tree or other colours to create a typical landscape scene. Decorate the Felt Australian Animals with Chromacryl Paint and set aside to dry. Assemble the hat, using a stapler to staple the two side and top flaps together at the back of the hat. Glue on the decorated Felt Australian Animals.